How does one go about becoming a scientist? What courses in college will help you become a mechanical engineer? What opportunities are available for math majors? What is the daily life of a computer technician really like? On Wednesday, April 17, from 5:30 to 8:30 p.m., the U.S. Department of Energy’s Fermi National Accelerator Laboratory will offer high school students a valuable opportunity to ask those questions in person. 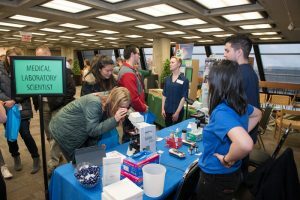 The annual Science, Technology, Engineering and Mathematics (STEM) Career Expo, held in the atrium of Wilson Hall, will put those students face to face with people actually doing the jobs they will be applying for in the coming years. In addition to Fermilab scientists and engineers, the STEM Career Expo will feature more than 100 professionals from more than 30 local companies and research organizations who will be on hand to explain what they do. But this is not a college or job fair, and is not about recruiting, according to organizer Susan Dahl of the Fermilab Office of Education and Public Outreach. “We hope students come away with a new view of the possibilities of finding careers in these fascinating fields and a more realistic idea of the individuals working in these very relevant and fascinating jobs,” Dahl said.